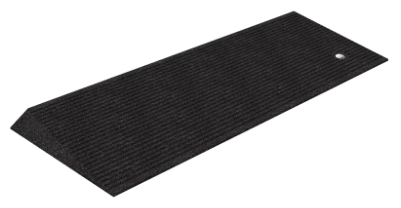 Rubber Beveled Threshold Ramps provide a smooth transition from the ground to your door's sill, making it much easier to get your wheelchair or scooter through the door. Each ramp is made of slip-resistant, 100% recycled rubber that can be used indoor or outdoors. In addition, ramps can be trimmed easily for a custom fit. Price is for a set of 2 Rubber Beveled Threshold Ramps.